During my latest class with Teaparker, we tasted high mountain oolong tea Teaparker just brought back from Burma. I would like to call it a libertea, but this great name is already taken by an online merchant. Why? Because this tea is made by the Chinese Wa clan. They are what remains of the Nationalist army of the Yunnan province which chose to escape to Burma's high and inpenetrable mountains rather than surrender to the Communists in 1948/1949. This fact should earn them the esteem of many in the free world. Unfortunately, the burmese junta (still in place) never allowed them to settle down in the low lands. They had to keep hiding and sometimes fighting in the mountains west of Yunnan. For a long time, their only real source of income there was opium! Yes, probably like in underdeveloped Afghanistan, they had to turn to poppies in order to survive autonomously at 1500 to 2000 meters altitude. But they want to come out clean, now! After unprofitable attempts with other crops, they are trying now to make a living with high mountain oolong tea. Teaparker has visited them and posted an article with pictures on his site. They started 4-5 years ago and can produce 20 tons of tea per year now. Their equipment is the same as in Taiwan and the trees, too. That's because a few ROC (Republic of China - Taiwan) tea farmers have agreed to help them and invest there. One such experienced farmer is also there to manage the plant where the leaves are processed. We tasted 2 of their latest teas of 2005: the summer oolong (right) and the spring oolong (left in the gaiwan). You can see at the large size of the leaves that the elevation of the plantation is high (1700 meters approx.) We compared them with oolong from neighbour Thailand and found it already superior. 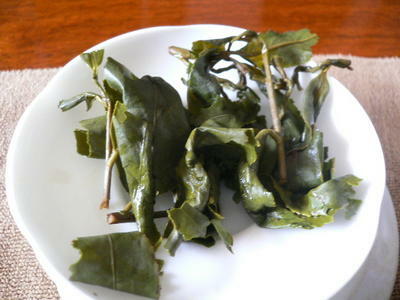 The dry leaves of the summer oolong looked quite dark. The dry smell reminded me of lavender! Unfortunately, summer is not the best season for oolong and the tea was indeed more astringent than what I'm used to. 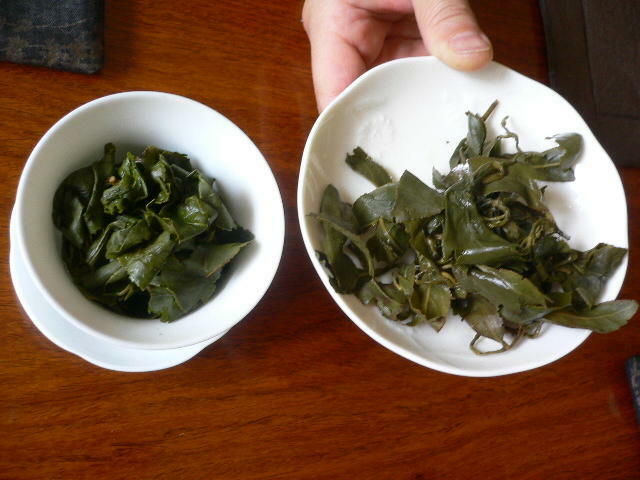 Their spring oolong (above) displayed much better characteristics. The leaves are of a nice green and display a low level of oxidation. Smell was pleasant, but not exceptional. The yun, the aftertaste in the mouth and throat, was weak but could be improved by using a clay teapot. While not on the same level as good high mountain oolong from Taiwan, this tea does have some of its characteristics. 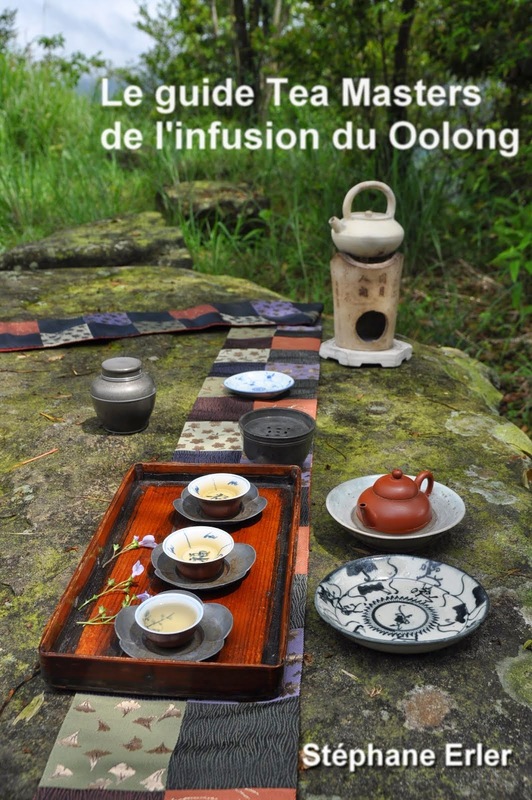 Teaparker has asked me to see if there is a foreign distributor interested in selling this tea as Golden Triangle oolong in North America or in Europe. He wants to help these very poor Chinese escape the dangers of the drug business. Just write to me and I'll give you his contact email. I would help make initial contacts, but I wouldn't take part in the actual business or make any money from it. 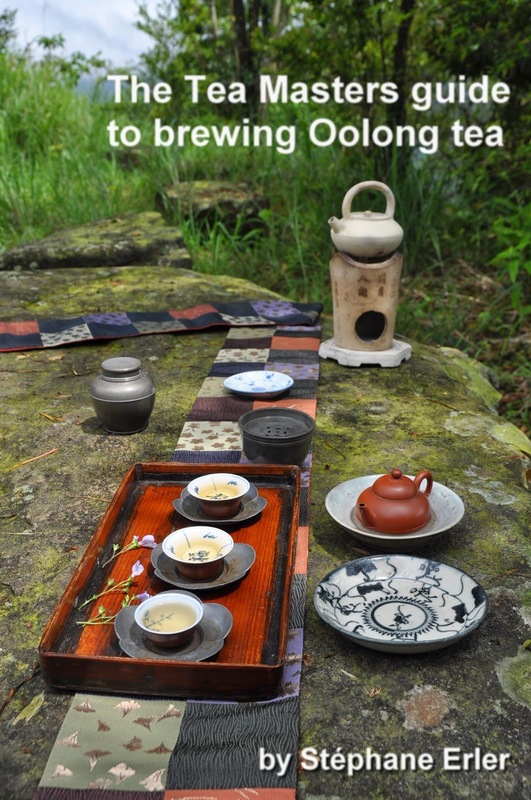 - "Golden Triangle Oolong: quench your thirst and help the poorest tea growers". Market: Left wing Demorat. - "Say no to drugs, say yes to Golden Triangle Oolong". Market: Concerned parents. Just don't do what Chinese businessmen will probably do (or are already doing) with this tea: "Cheap Taiwan high mountain oolong!" A latest report on TV this weekend said that 70-80% of Taiwan's tea contains foreign tea from China, Vietnam(..) to cut costs! It goes without saying that I go through the trouble to buy my teas only from the most trusted sources I can find!